Visit Tintamarre Island ,Creole Rock and Pinel Island on the same day. Snorkel with turtles and tropical fish, enjoy a great Lunch on Grand Case in a French restaurant (NO SANDWICHES) and sip rum punch on the beach and work on your tan. Snorkeling gears with flotation (instructions for beginers) free drinks, lunch and snack included. 5 star service guaranteed. A trip of a lifetime. Enjoy this amazing eco-tour with 5 stops, giving you a little bit of everything you can experience on this beautiful island. Billy Bones, your comfortable 28-foot powerboat for the day. The professional and friendly crew with provide you with first class snorkeling gear for adults and kids, serve up drinks from the open bar and prepare snacks. These amenities on board make the day even better than you can ever imagine! 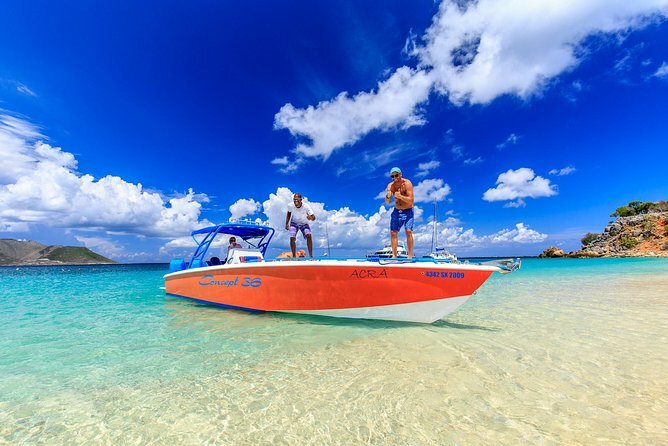 The first part of the tour will include a brief sightseeing cruise along the coast with a view of Saba and St. Barth then you will arrive at the Simpson Bay Lagoon, the largest saltwater lagoon in the Caribbean. This is also the temporary home for many million dollar "Mega Yachts". After going under three bridges the boat will reach Tintamarre Island where you will get to snorkel with turtles and enjoy what this gorgeous, uninhabited island has to offer. After Tintamarre, the boat will cruise over for the next stop - Pinel Island. Here there will be time for more snorkeling and you can feed the iguanas that call the island home. After Pinel Island, the boat will take a nice cruise until you reach Creole Rock for more snorkeling. Explore this amazing rock formation which is part of the French National Park and is loaded with tropical fish and corals. This is a must see snorkeling destination on the island. You will feel like you are in an aquarium! When we finish with our lunch Long Bay waiting for us for a real beach time. Here we will introduce you to our unique floating bar time or just relax on the white sand beach and work on your tan. Of course on a way back we stop at the Airport beach where you can experience how’s that when a plane landing above your head. We back at the Philipsburg at 3 30pm which is still give you a bit of time to explore the main city on the Dutch side. Of course we really happy to assist you and give you our best advice what to do there. Departs from most St Maarten hotels and Bobby's Marina for cruise ship guests.